Doctor Who: Stories From The Scrapheap - THE PSYCHONAUTS | Warped Factor - Words in the Key of Geek. Christopher Morley visits the fields of the Nephilim for another story from the Doctor Who scrapheap. 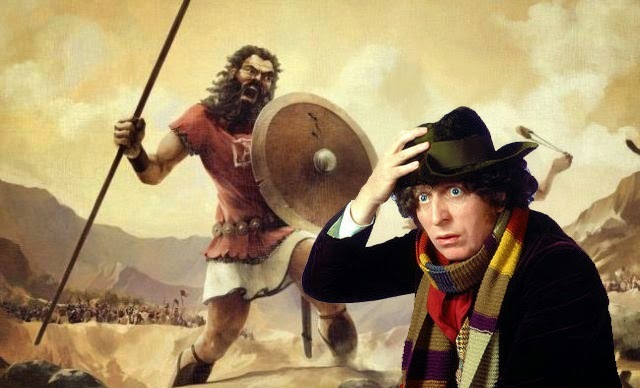 In this week's rummage through the scrapheap of the many junked adventures for the Doctor, we'll be treading the waters of theology! For we turn our attention to the Nephilim, as mentioned in the Hebrew Bible- writer David Fisher adopting their name for his intended alien race traversing time in sarcophagus-like vessels. The Psychonauts- as the story was titled- would have seen the Fourth Doctor dipping a toe into religious matters in much the same manner as his next incarnation would in Kinda, which can be read as a sort of Biblical allegory in that a serpent ( the Mara) corrupts an Eden-ish paradise. Indeed the name of the Mara itself also belongs to a Buddhist demon....not surprising considering writer Christopher Bailey 's interest in such themes! And but for the complete lack of interest on the part of new producer John Nathan-Turner, who preferred The Leisure Hive in its intended Season Eighteen slot, much the same thinking might have been applied by Fisher. He'd already written The Stones Of Blood & The Androids Of Tara for Season Sixteen as well as The Creature From The Pit for the next, but it seems even that couldn't change the mind of the man in charge! What was it that made the Nephilim such an interesting potential subject? There are several possible interpretations of their exact role in the Godly narrative from which Fisher sourced them- one being that they were the offspring of unions between angels of a sort, or ''sons of God'' & mortal women- ''daughters of men'', as set down in Genesis 6:4 of the Hebrew holy text the Torah. This has led many scholars to speculate that the Nephilim were the children of fallen angels, tempted by the charms of good Biblical ladies. "When man began to multiply on the face of the land and daughters were born to them, the sons of God saw that the daughters of man were attractive. And they took as their wives any they chose." Those naughty boys. Would you Adam & Eve it? And a little further research reveals that the proper translation of their name is indeed ' giants'. But there is yet another school of thought, rejected by creationists according to www.answersingenesis.org. They absolutely refute any suggestions that the Nephilim could have been alien in origin, which is exactly what might have intrigued David Fisher enough to propose The Psychonauts in the first place! Just why is it that they reject the idea outright? Spoilsports! Further rain is then poured on our parade. ''Problems are multiplied when we consider the possibility of intelligent alien life. Science fiction programming abounds with races of people who evolved on other worlds. We see examples of Vulcans and Klingons —pseudohumans similar to us in most respects but different in others. As a plot device, these races allow the exploration of the human condition from the perspective of an outsider. Although very entertaining, such alien races are theologically problematic. Intelligent alien beings cannot be redeemed. God’s plan of redemption is for human beings: those descended from Adam.''. Bad news for Spock & Worf, then! And come to think of it, the Doctor too!